The first plot is the easiest to create using Python; visualizing the kernel density estimation. 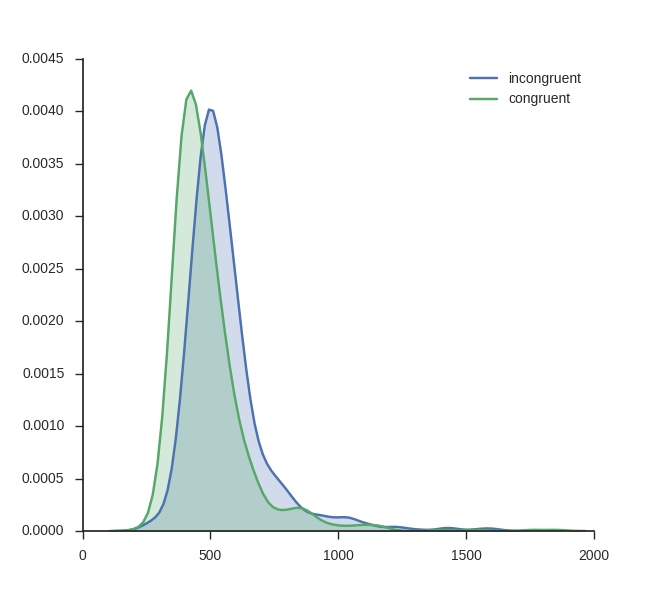 It can be done using the Seaborn package only. kde_plot takes the arguments df Note, in the beginning of the function I set the style to white and to ticks. I do this because I want a white background and ticks on the axes. 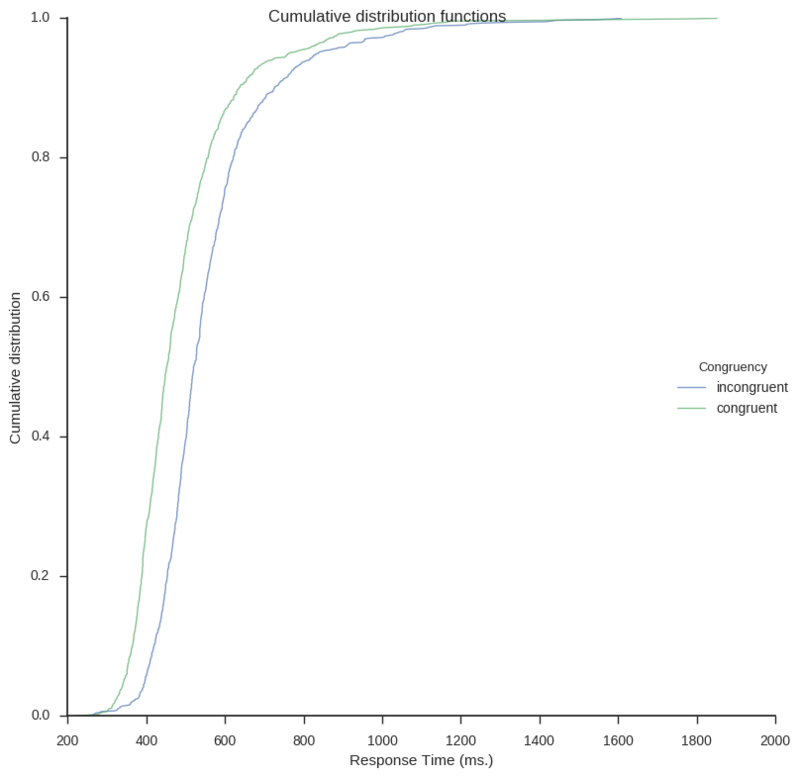 Next out is to plot the cumulative distribution functions (CDF). In the first function CDFs for each condition will be calculated. It takes the arguments df (a Pandas dataframe), a list of the conditions (i.e., conditions). Next is the plot function (cdf_plot). The function takes a Pandas a dataframe (created with the function above) as argument as well as save_file and legend. 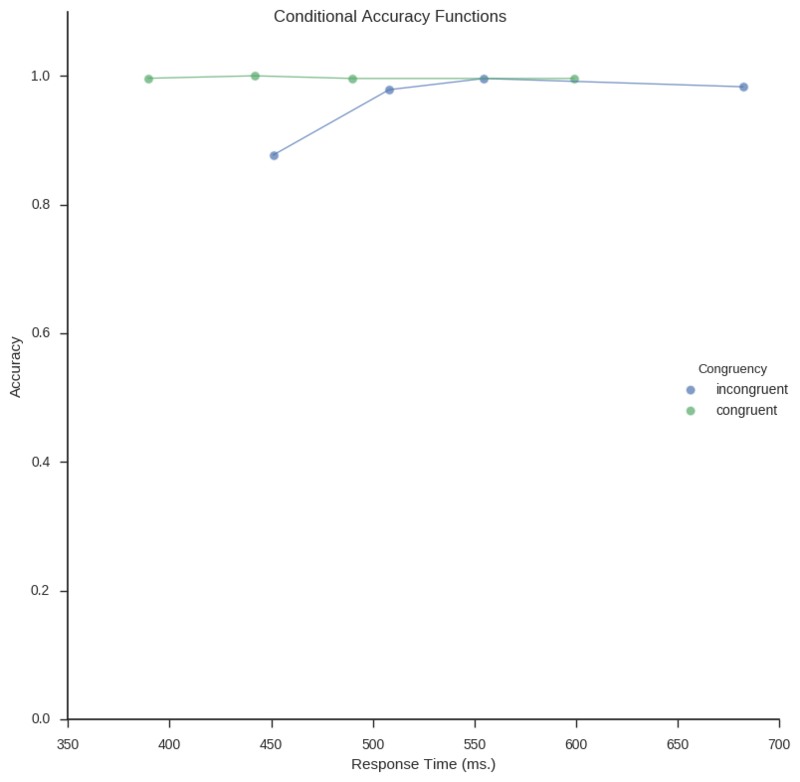 In Psychological research Delta plots (DPs) can be used to visualize and compare response time (RT) quantiles obtained under two experimental conditions. DPs enable examination whether the experimental manipulation has a larger effect on the relatively fast responses or on the relatively slow ones (e.g., Speckman, Rouder, Morey, & Pratte, 2008). In the following script I have created two functions; calc_delta_data and delta_plot. calc_delta_data takes a Pandas dataframe (df). Rest of the arguments you need to fill in the column names for the subject id, the dependent variable (e.g., RT), and the conditions column name. All in the string data type. The last argument should contain a list of strings of the factors in your condition. Next function, delta_plot, takes the data returned from the calc_delta_data function to create a line graph. The above functions are quite easy to use. First load your data (again, I use data from a Flanker task). caf_plot (the function below) uses Seaborn, again, to plot the conditional accuracy functions. Right now, the function for calculation the Conditional Accuracy Functions can only do one condition at the time. Thus, in the code below I subset the Pandas dataframe (same old, Flanker data as in the previous examples) for incongruent and congruent conditions. The CAFs for these two subsets are then concatenated (i.e., combined to one dataframe) and plotted. Update: I created a Jupyter notebook containing all code: Exploring distributions. Luce, R. D. (1986). Response times: Their role in inferring elementary mental organization (No. 8). Oxford University Press on Demand. 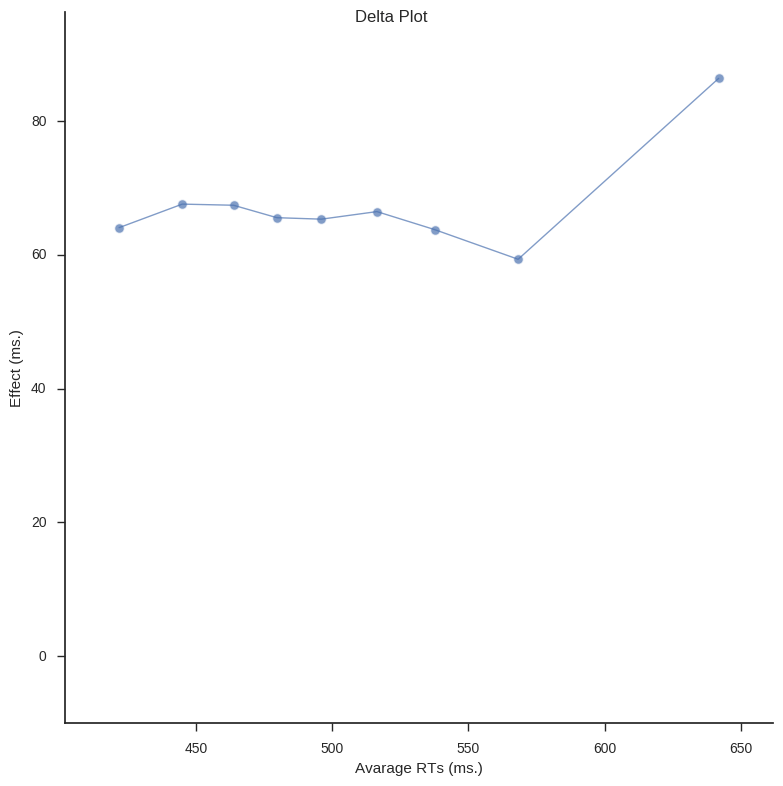 Hi, thank you for the great tutorial on delta plots, it was very helpful! Am I correctly assuming that index “rt” should be “dv” (lines 24&25) and “n_subjects” should be “subjects” (line 15) in order to use it straight away with my own data? Thank you. Glad you found it helpful and yes, you are correct. I will update and correct the code example!